I really enjoyed my appointment with Dr. Stoll as you can tell that he loves what he does. He is superfriendly and nice and made me feel comfortable right away. I will definitely continue going to this practice. I really enjoyed my appointment with Dr. Stoll as you can tell that he loves what he does. He is super friendly and nice and made me feel comfortable right away.I will definitely continue going to this practice. I was changing from my New Jersey office and a friend recommended Dr. Stoll. He was very thorough and friendly. Ifelt comfortable with him and I also felt that he genuinely cares about doing his job well. Everyone working there is really nice and knows what they are doing. I was changing from my New Jersey office and a friend recommended Dr. Stoll. He was very thorough and friendly. I felt comfortable with him and I also felt that hegenuinely cares about doing his job well. Everyone working there is really nice and knows what they are doing. 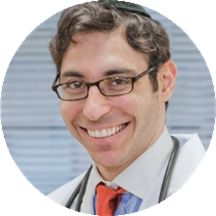 Dr. Steven Stoll has been surrounded by doctors his entire life. His father is a doctor, as was his father and older brother before him. His wife is a doctor. His sister-in-law is a doctor. A few of his cousins are doctors, and his brother-in-law is currently in medical school. It is not much of an exaggeration to claim that regardless of specialty, Dr. Stoll's family has it covered. Growing up in such an environment, he was fortunate enough to never lack for immediate and attentive medical care. Be it sutures or facial cream, he usually had the “cure” within a couple of hours. Which is why in medical school, it surprised Dr.Stoll that not everyone shared his idealized version of the medical field. From classmates and patients alike, he heard horror stories of having to wait months for an appointment, of never seeing the same physician twice, and of never being able to reach their physician when necessary. He quickly realized that most people carried a much harsher perspective towards medicine in general, and towards doctors in particular. At Stoll Medical Group, Dr. Steven Stoll and staff resolve to change that. They firmly believe that everyone should have access to personal, attentive, 24/7, “concierge” care, regardless of connections. They also feel that an available doctor, is a good doctor. Concierge patients can expect the same care that would be provided to their own relatives: same day appointments, twenty-four hour cell phone and e-mail access, the best specialists available, and much more. Dr.Stoll considers himself fortunate to come from a family of physicians, with all the medical connections that provided. But, by joining the Stoll Medical Group family, you get that and more. Lead author – Stoll S., Shalita A., Webster G., Kaplan R., Danesh S., Penstein A., "The effect of the menstrual cycle on acne." Journal of the American Academy of Dermatology (2001); 45 (6): 957-960. He was a funny guy that clearly loves what he does. I highly recommend him. Dr Stoll is such a pleasant and caring physician - always positive! Dr. Stoll seems to be a very pleasant person to interact with and is quick with a joke. Helpful and right to the point! Got me the help I need. Excellent experience. I don't think many people ever say they enjoyed their doctors visit. This was a very enjoyable experience! Dr. Stoll and the entire staff were very a pleasure to visit with. Always a pleasure to go to this doc! He is a very nice guy.. who is funny and seems to love his job and the people he works with...Was very professional and calming as I was not...esp when they have to take blood...ugh. Great place...smiling faces and clean...overall great experience! 2nd visit to Dr. Stoll. I would recommend seeing him if you need a physician. Good bedside manner and creates an atmosphere that puts you at ease. I trust him. To get the most from your visit be prepared with yourconcerns, questions and be honest. He can be a good partner on your health journey. Very personable and made me feel very comfortable! Everyone was friendly and professional. The asthetics of the clinic were very nice. Dr. Stoll was easy to talk to, had a great sense of humor and inspired the utmost confidence in his abilities. Dr. Stoll is definitely a character. He made some "dad jokes" the entire visit and was still able to provide his professional opinion. While I appreciated his friendly nature, I'm not sure that I would recommend him to others who arelooking for more of a "traditional" style doctor. The office feels very ~trendy~ (for example, they offer complimentary mini waters in a fridge) and they are all very bubbly and helpful. Just kind of caught me off-guard since I was expecting more of a traditional and more serious feel. All staff that assisted me were friendly and good at their jobs. Dr. Stoll himself was very genial and did a good job of making sure I had a chance to voice all of my health concerns (something that I have not experienced at my previous care providers). Dr. Stink was amazing as usual. The nurse who saw me first wasn’t as friendly or engaging. She did not introduce herself and was very cut and rushed with the questions. Dr Stoll is hilarious and very helpful. Terrific, professional, kind office and excellent doctor. Dr Stoll walked in and immediately set a lighthearted tone. He was easy to talk to and very reassuring. Dr. Stoll was very nice however, I felt a little embarrassed after telling him a personal concern I had for my visit and I thought he could have done a little bit more to make me feel more comfortable instead of ashamed and embarrassed. Dr. Stoll is great. He’s always able to help and is spot on with his diagnosis. I appreciate that he provides options for treatment and let’s you make the decision. Incredible personality to match his professionalism and medical acumen. I highly recommend him to any and everyone! I have been going to Dr. Stoll for a few years and he is so great. He never rushes you and takes the time to understand what is going on with you physically. He also is very personable and kind. I highly recommend. I found Dr. Stoll to be very personable which was relaxing for a first time visit. He was very attentive and listened to my concerns and knowledgeable when addressing them. Additionally, his staff is young and very friendly which is refreshing! Awesome guy! Great doctor and extremely efficient, but also just really cool. I am so happy I found Dr. Stoll! I always just completely dreaded going to the doctor. I felt like every doctor I’d been to in the past was so quick to disregard my concerns. Dr. Still made me feel verycomfortable and made the appointment enjoyable and as painless as possible. I also love the look of the office even though it is currently under construction. It’s also incredibly convenient that you can get your blood drawn and other vaccines right there. I will recommend him to everyone I know!! Came for referral to specialists. Incredibly helpful. Great referrals and advice/insight on my different minor conditions. He's young, energetic, enthusiastic, highly knowledgeable, and his office/staff are impeccable. Very grateful to have him! Asked for a doctor's note in order to write off counseling as an HSA expense. Dr. Stoll was very helpful. Dr. Stoll's bedside manner is great! He thinks quick on his feet and is able to help with whatever issue I or my husband come in with. I have been referring all my friends to him for years! Dr. Stoll always makes me feel confident that I will feel 100% after his visit very soon! I liked Dr Stolls interaction, he has diverse medical knowledge ranging through various disciplines. I enjoyed speaking with him and appreciated his knowledge. I always enjoy my visits here! Very efficient, welcoming and professional!! The staff was extremely pleasant. Dr. Stoll met with me even though, due circumstances out of my control I was 30 minutes late to my scheduled appointment. Super energetic and personable. Stoll is thorough, kind and a great source of calm to nervous patients. Dr. Stoll is a class act. Great personality & great doctor who took the time to listen and share his expertise. The office folks here are all so friendly, and Dr. Stoll is always so energetic. Personally, I love his communicative style. Dr Steven Stoll was highly impressive. He made me feel comfortable from the minute he walked through the door for my consult. I’ve been fearing going to the Doctor for awhile so that was important. He made me laugh a lot,which put me at ease and he made the process seemless. He was knowledgeable and professional as you would expect from a Doctor, but his personality took him over the top for me!!!!! Thank you. finally a Doctor I want to go back to. Love this office! Very professionally run and everyone is very helpful and friendly! He put me at ease. Very down to earth. Personable and like-able. Definitely recommend. They draw blood onsite and the staff is great. Be prepared with questions. Will be going back and making my PCP. Delightful experience, outside of the illness, and everyone working there was both professional and compassionate. Recommended!